A lander in the lunar crater Tsiolkovsky would deposit a series of rovers to deploy a set of arms containing individual antennas. The astronomical signals picked up by the antennas would be transmitted to back to the central lander for processing. A telescopeon the far side of the moon could probe the "dark ages" of theuniverse while blocking out the radio-wavelength noise of Earth civilizations. Up to onehundred thousand antennas would form the Dark Ages Lunar Interferometer (DALI),the largest telescope ever built, and allow astronomers to hear faintwhispering signals from a time when no stars even existed. "Thiswill look at one of the most fundamental questions ever conceived, back whenthe universe was made up almost entirely of hydrogen and helium — nostars, no galaxies," said Kurt Weiler, senior astronomer at the U.S. NavalResearch Laboratory. Theso-called dark agesof astronomy describe a half-billion year period following the Big Bang whenclouds of ionized gas cooled as the universe expanded. The only faint noise camefrom hydrogen atoms doing spin-flips, which gives off radio-wavelength signalsthat astronomers can pick up on. Scientists currently estimate that theuniverse is about 13.7 billion years old. "Whathappens is that because of the Big Bang there's a background glow," Weilernoted. "The spin-flip will absorb the glow of the older material and willgive us a signature that we can see." However, theongoingexpansion of the universe has stretched or red-shifted the hydrogen signaturefrom just 21 centimeters to several meters. That means the signals can easilyget masked by louder Earth transmissions in the same wavelength, unlessastronomers find a quieter listening spot. "Theback side of the moon is the onlyplace in the local universe shielded from manmade transmissions," Weilertold SPACE.com. The DALIdesign resembles existing radiotelescope arrays in the Netherlands, Australia, and New Mexico. But sending such an array to the moon requires lightermaterial that can save on launch costs, not to mention survive the harsh lunarconditions. Onecandidate is polyimide, a plastic-like film which can act as an antenna whenplated with metal. University of Colorado researchers are testing the film's durability by exposingit to harsh ultraviolet rays, as well as the extreme temperatures like that ofboiling water and super-cold liquid nitrogen. The filmantennas would be rolled up and then unrolled for deployment across 30 miles(48 km) of lunar surface, arrayed in one thousand stations containing onehundred antennas each. Still, getting the entire load to the moon represents achallenge. "Eventhough each antenna may weigh a few ounces, you're talking about needing atleast heavy lift vehicles," Weiler noted. "They all add up fast." 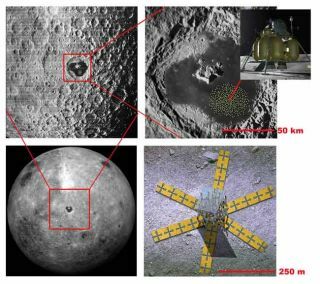 The U.S. NavalResearch Laboratory is sharing NASA funding with an MIT-based team working onanother lunar telescope separate from DALI. Their collaboration may finallyrealize a dream that many astronomers had even before the first Apollo landingson the moon. ?Probingthe dark ages presents the opportunity to watch the young Universe evolve,? saidJoseph Lazio, NRL astronomer and head of the DALI proposal. ?Just as currentcosmological studies have both fascinated and surprised us, I anticipate thatDALI will lead both to increased understanding of the Universe and unexpecteddiscoveries."